NYPD police officers have very dangerous jobs. Law enforcement officers, in general, face a high risk of sustaining a serious or fatal personal injury. 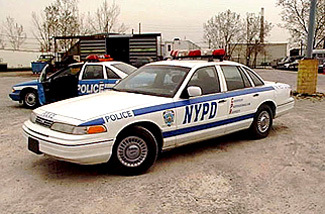 NYPD officers can be involved in car accidents while on patrol or during high-speed chases, resulting in serious personal injury or death. Law enforcement officers can also suffer personal injury from defective equipment, reckless high speed pursuits, or traveling through an intersection without lights or sirens. My firm has significant experience representing injured police officers. In one example, our firm represented an off duty police officer in Brooklyn who was struck by a Department of Transportation vehicle while being issued a parking summons. Even though our client identified himself as an officer, the DOT officer failed to comply with our client's request to call a supervisor, and instead recklessly drove away striking our client and causing permanent spinal injuries. The matter was brought to court and settled for $2,000,000. If you are a police officer and sustained a line of duty injury or through the negligence of a co-worker or by a third-party (building owner, another motor vehicle or truck), you may have the right to pursue those claims. If you are off duty and sustained an injury, you will also have the right to pursue an action. If you are unable to visit our New York office, arrangements can easily be made for us to visit you. If you were injured in the line of duty, you should contact our office and speak with a NYC Personal Injury attorney. NYPD law enforcement officers that have been involved in a personal injury accident may be entitled by law to receive monetary compensation and other benefits beyond line of duty benefits for their pain, suffering, disability, medical bills, and lost income. Todd J. Strier was the acting General Counsel to the NYPD Honor Legion for 22 years. He has learned to appreciate the significant dangers encountered by officers each day and takes pride in his ability to provide assistance in their time of need. If you or someone you know has suffered injuries in the line of duty, contact our offices at 1-877-794-3333 and discuss your case with a New York City personal injury attorney. We will provide you with a Free Case Evaluation. Our law firm can help victims in the Bronx, Brooklyn, Manhattan, Queens, Staten Island, Nassau County, Suffolk County, Rockland County, Westchester County, and Orange County.